Suitable for Chimney Sweeps, Stove installers & Any other trade that wants to keep track of customer information in the office and on the go. The Digital Sweeps Database is a customer management system to store your customers information. Schedule your appointments and keep track on how many calls you have each day in a diary page. Once a customer has booked an appointment you can carry your data with you on an iPad or iPhone and fill in a sweeping certificate on site, which can then be emailed directly to your customer. You then have all the key information to send special offers and reminders to help your customer book in the following year. Emailing all of your paperwork will help to save you money on certificates and invoices. 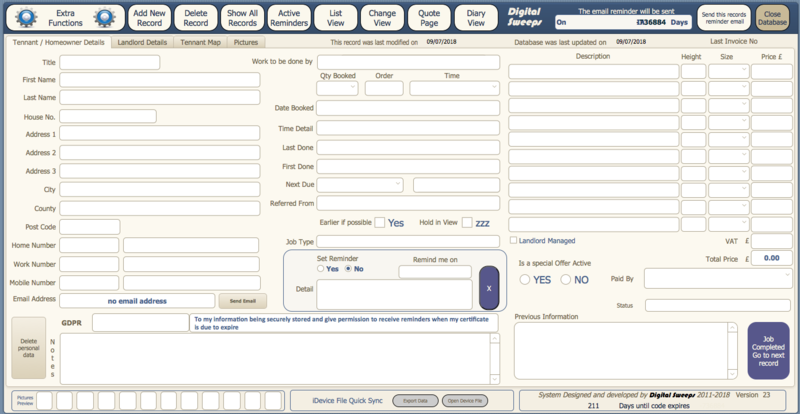 Quick form filling options mean you don't spend valuable time hand writing certificate after certificate. If you forget when to remind your customer when they are due, not to worry, the database will automatically send email reminders when they are due. You can even print custom reminder cards for the customers who don't have email address. ​Although the system was built for chimney sweeps, it is so versatile it can be converted to any trade.